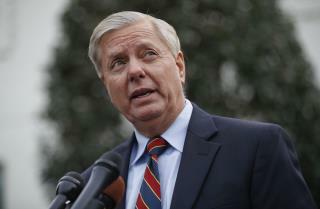 (Newser) – Seems Sen. Lindsey Graham had a productive lunch with the president. Emerging from a White House meal Sunday, he said President Trump is putting the brakes on US troop withdrawal from Syria: "I think we're slowing things down in a smart way," he said, per CNN. "I think we're in a pause situation where we are reevaluating what's the best way to achieve the President's objective of having people pay more and do more." He apparently buttered up Trump a little ("I assured him that nobody has done more to defeat ISIS than he has") but didn't portray him too well afterward, saying it was "eye-opening" for Trump to learn on his Iraq trip that ISIS wasn't "completely destroyed." Now that Lindsay doesn't have McCain to fall back on for his hawkish stance I have no doubt he will be compliant. It's time to quit wasting money and lives in those sh!thole countries. We have Xi and Vlad to counter. Let Turkey mop up ISIS. It will be great training for a NATO ally. Lmao trump flip flops again . Maybe Fox News and Ann Coulter will change his mind back .